This generous book draws on an extensive survey of DIY archival ventures, the practices, experience and insights of people dedicated to the heritage of popular music. Baker’s writing attests authoritatively, clearly and sensitively to the value of DIY archival activity in everyday life and for the importance of popular music as an integral part of our shared cultural histories. Baker offers a deft balance of extensive empirical detail and theorisation regarding a number of current issues concerning the creation and status of the DIY archive, its affective dimensions and its sustainability in the face of a range of challenges. 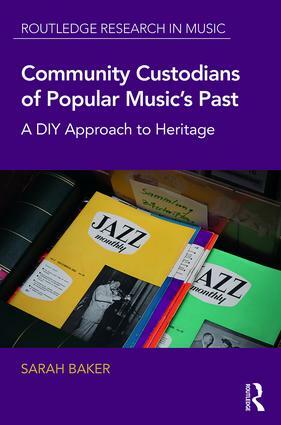 While this book will be of interest to popular music scholars and DIY practitioners both, it has a lot to say a wider constituency concerned with public history and offers a starting point for further research, theorisation and indeed practice. Sarah Baker is an Associate Professor of Cultural Sociology at Griffith University, Queensland, Australia. This series is our home for cutting-edge, upper-level scholarly studies and edited collections. Considering music performance, theory, and culture alongside topics such as gender, race, ecology, film, religion, politics, and science, titles are characterized by dynamic interventions into established subjects and innovative studies on emerging topics.